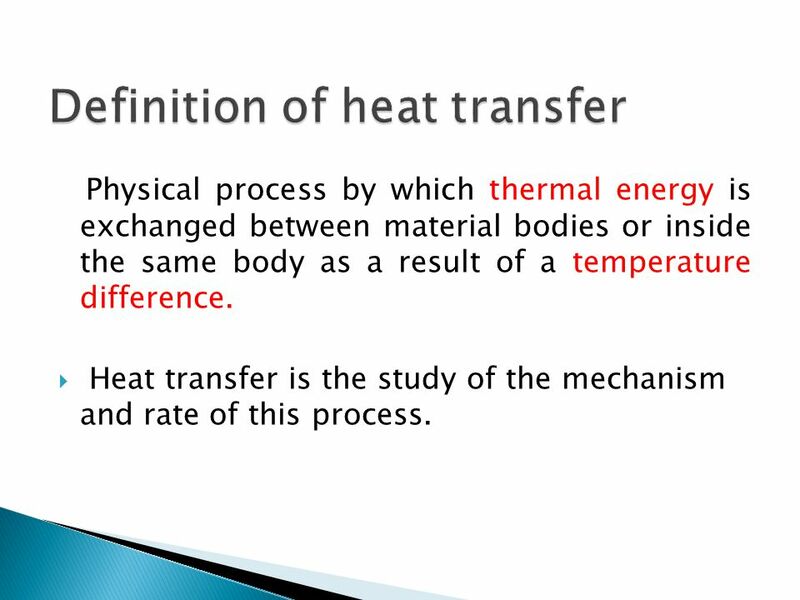 Physical process by which thermal energy is exchanged between material bodies or inside the same body as a result of a temperature difference. 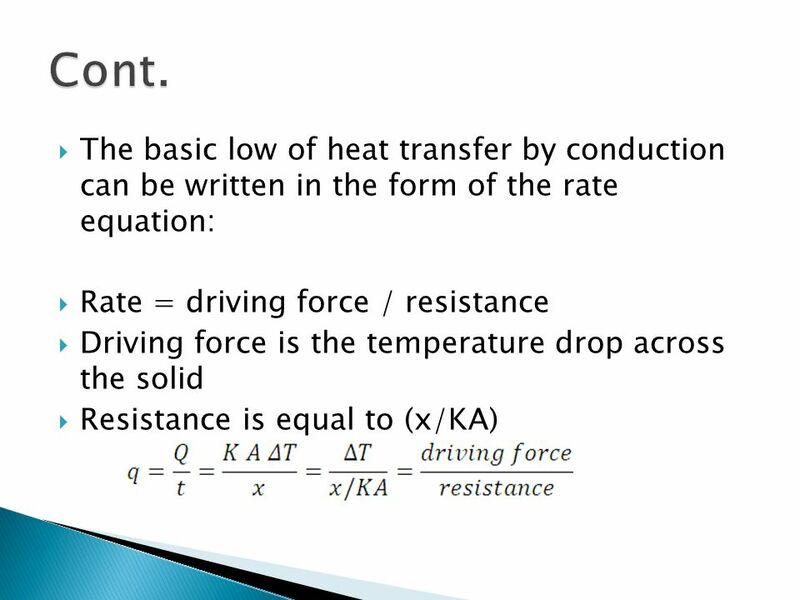 Heat transfer is the study of the mechanism and rate of this process. 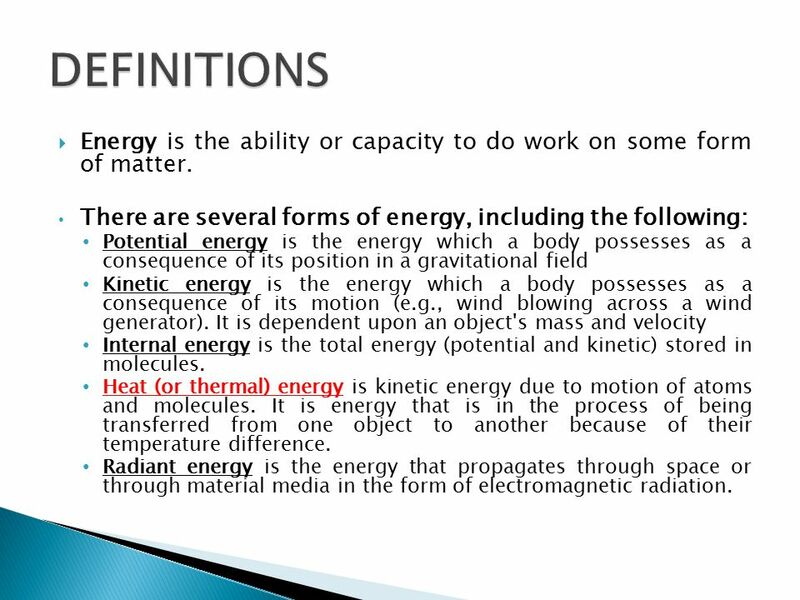 3 DEFINITIONS Energy is the ability or capacity to do work on some form of matter. There are several forms of energy, including the following: Potential energy is the energy which a body possesses as a consequence of its position in a gravitational field Kinetic energy is the energy which a body possesses as a consequence of its motion (e.g., wind blowing across a wind generator). It is dependent upon an object's mass and velocity Internal energy is the total energy (potential and kinetic) stored in molecules. 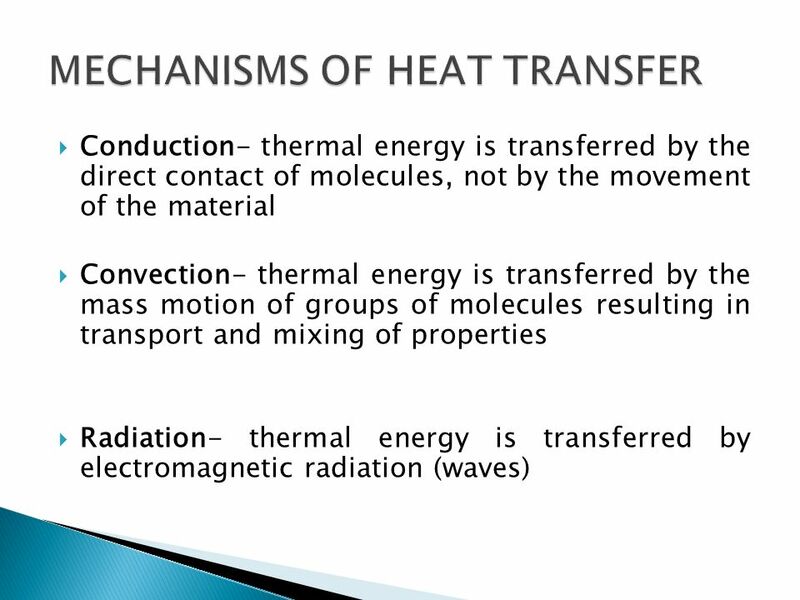 Heat (or thermal) energy is kinetic energy due to motion of atoms and molecules. It is energy that is in the process of being transferred from one object to another because of their temperature difference. Radiant energy is the energy that propagates through space or through material media in the form of electromagnetic radiation. 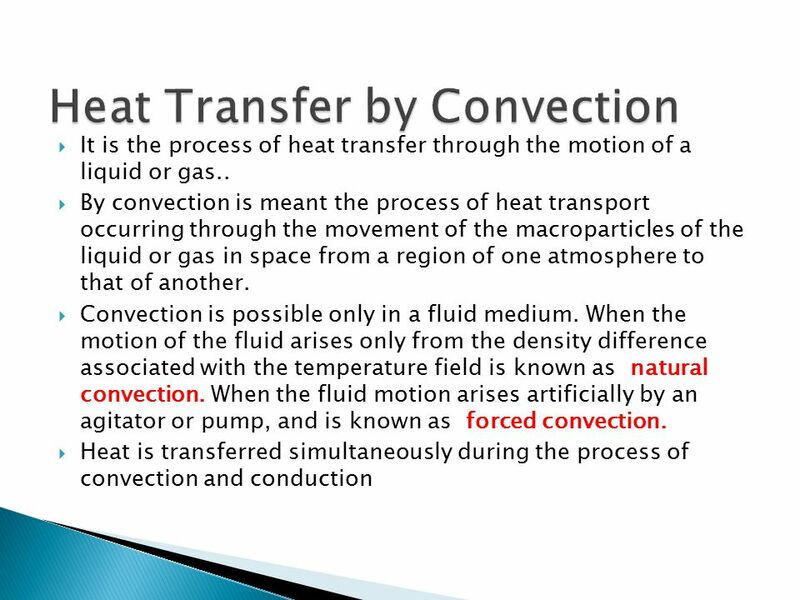 Conduction heat transfer: the flow of heat from one part of a body to another, or from one body to another, without appreciable displacement of the particles. 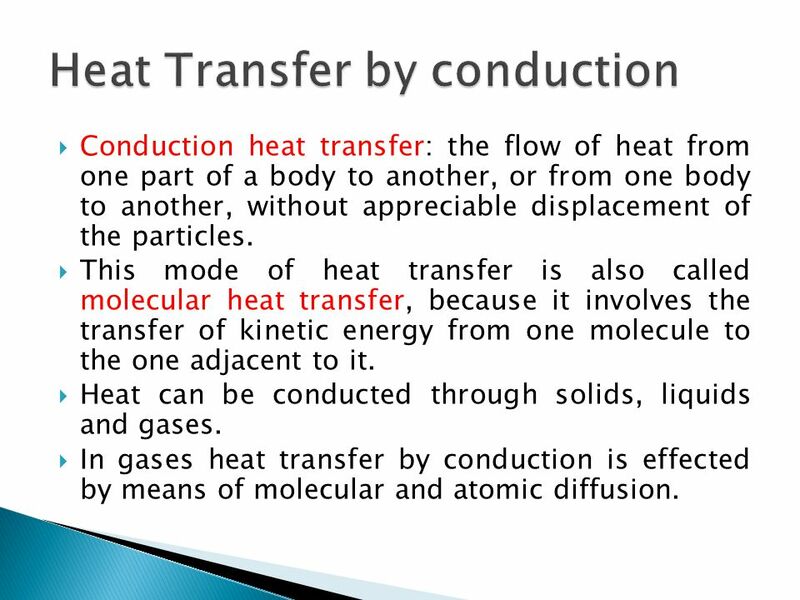 This mode of heat transfer is also called molecular heat transfer, because it involves the transfer of kinetic energy from one molecule to the one adjacent to it. Heat can be conducted through solids, liquids and gases. In gases heat transfer by conduction is effected by means of molecular and atomic diffusion. 6 Cont. Conduction in the bulk of fluids is normally overshadowed by convection but it assumes great importance at fluid boundaries. 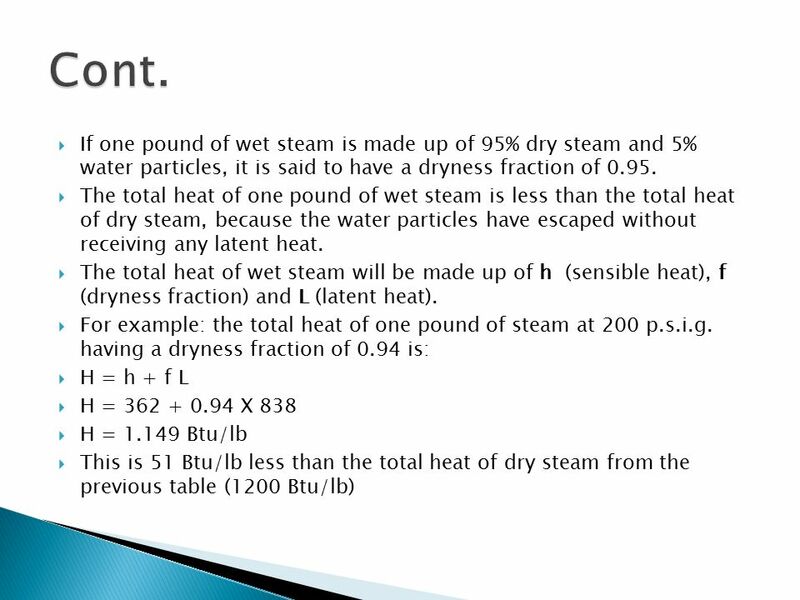 In metals heat transfer is mainly due to the diffusion of free electrons. 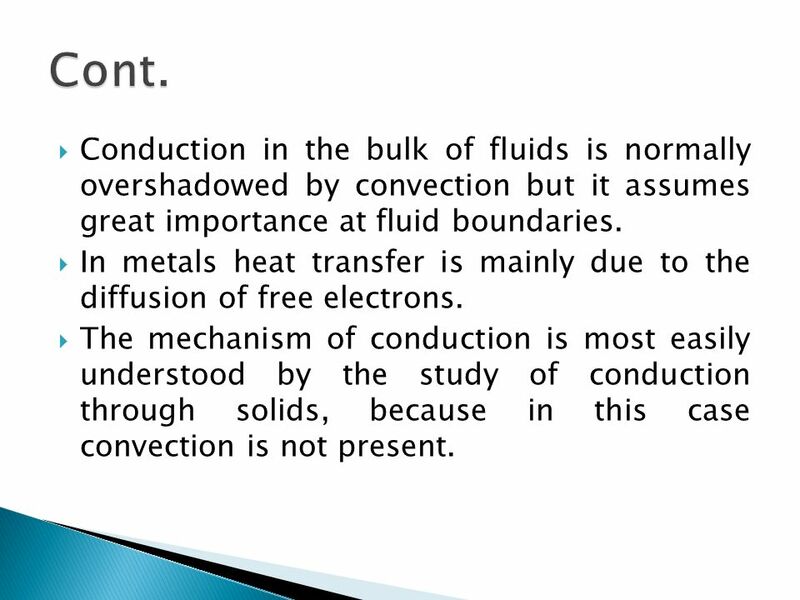 The mechanism of conduction is most easily understood by the study of conduction through solids, because in this case convection is not present. 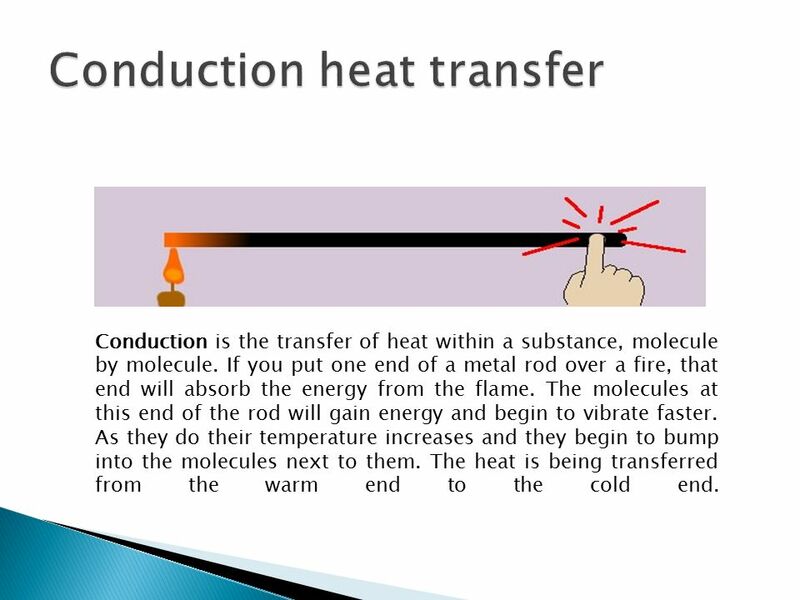 Conduction is the transfer of heat within a substance, molecule by molecule. If you put one end of a metal rod over a fire, that end will absorb the energy from the flame. The molecules at this end of the rod will gain energy and begin to vibrate faster. As they do their temperature increases and they begin to bump into the molecules next to them. The heat is being transferred from the warm end to the cold end. Fourier's law is an empirical law based on observation. It states that the rate of heat flow, Q/t, through a homogeneous solid is directly proportional to the area, A, of the section at right angles to the direction of heat flow, and to the temperature difference along the path of heat flow, dT/x i.e where A is the cross-sectional surface area, ΔT is the temperature difference between the ends, Δx is the distance between the ends. Consider an area A of a wall of thickness x. 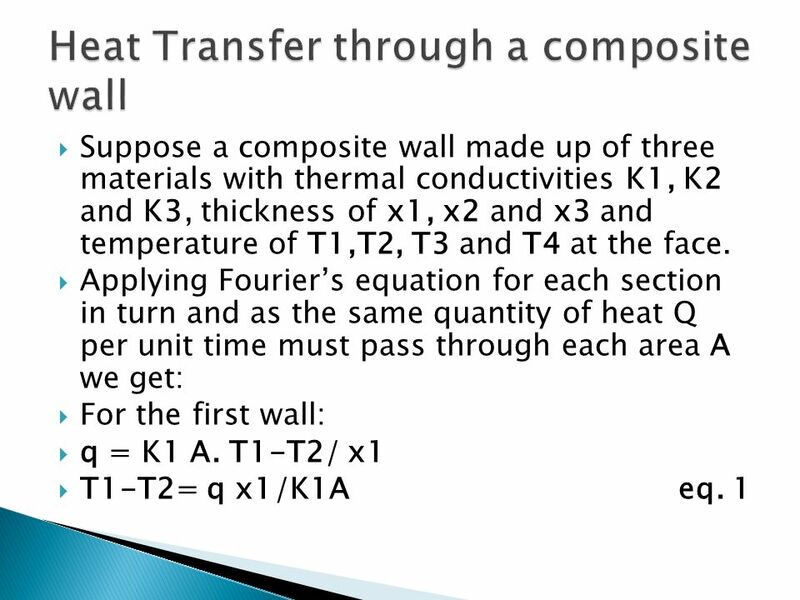 Let temperature be uniform over the area A on one face of the wall (T1) and uniform but lower over the same area on the opposite face (T2). 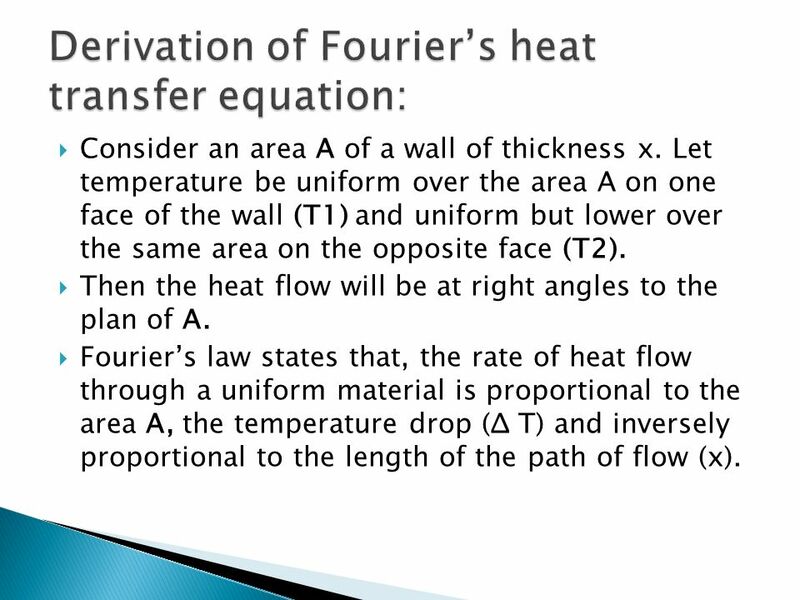 Then the heat flow will be at right angles to the plan of A. Fourier’s law states that, the rate of heat flow through a uniform material is proportional to the area A, the temperature drop (Δ T) and inversely proportional to the length of the path of flow (x). 14 Cont. As you can see air does not conduct heat very well. 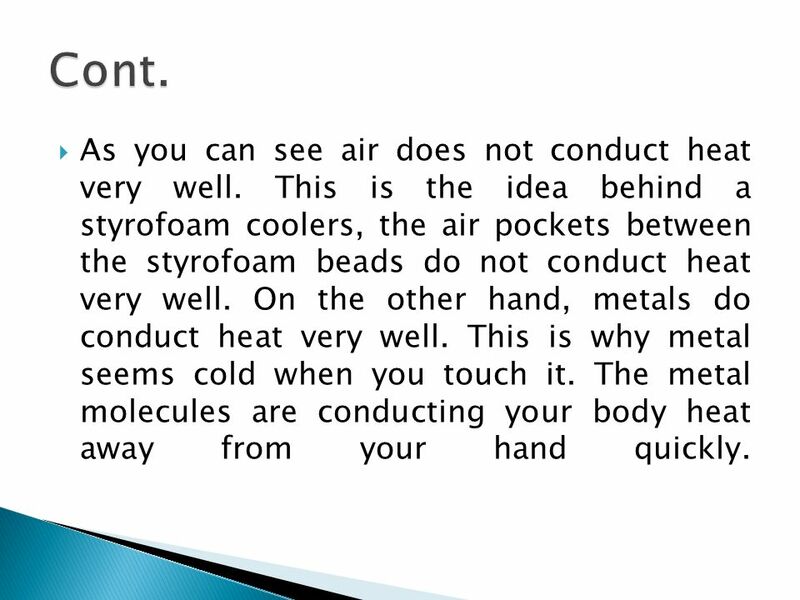 This is the idea behind a styrofoam coolers, the air pockets between the styrofoam beads do not conduct heat very well. 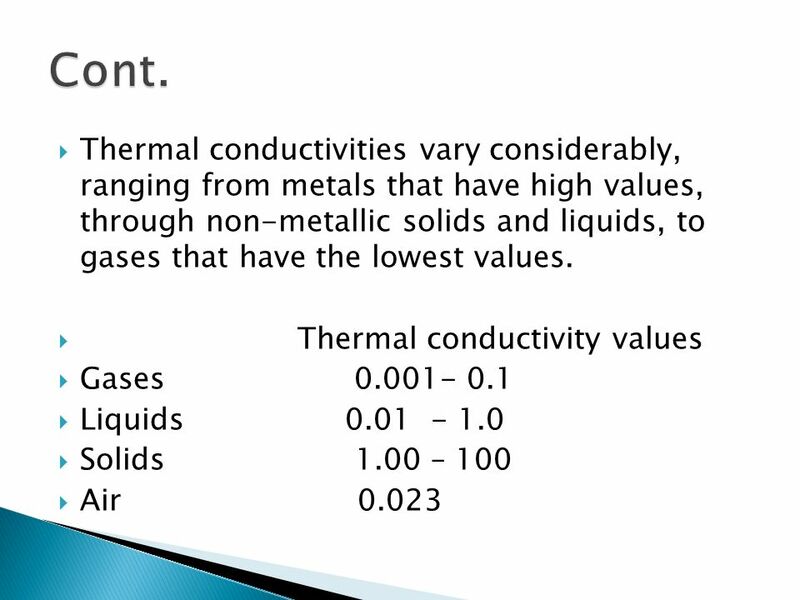 On the other hand, metals do conduct heat very well. This is why metal seems cold when you touch it. The metal molecules are conducting your body heat away from your hand quickly. 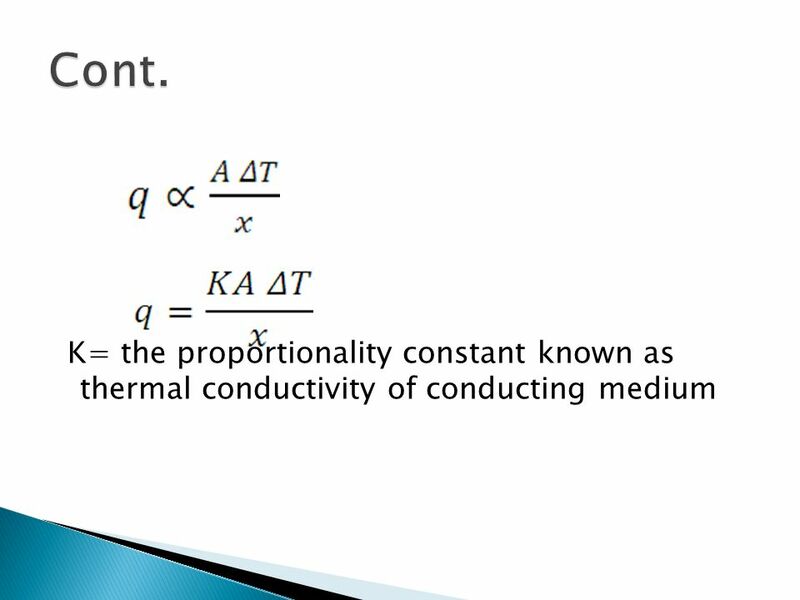 Thermal conductance (K/x) is the amount of heat energy per area of material per degree difference between the outside and inside. 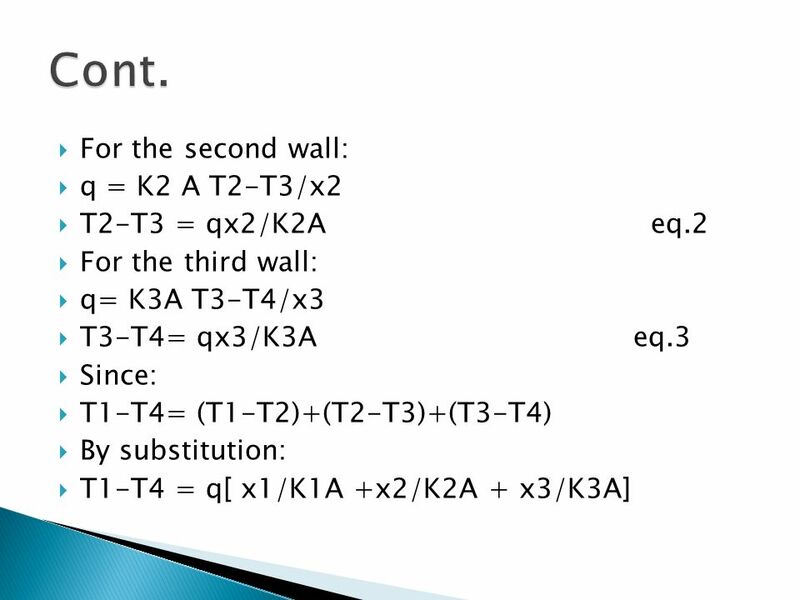 Q/t= K A dT/x K/x = Q/t /AdT K/x = Q/t A dT So its units is Btu/ square ft. hr. F˚. In the English system and Watt/ square meters. 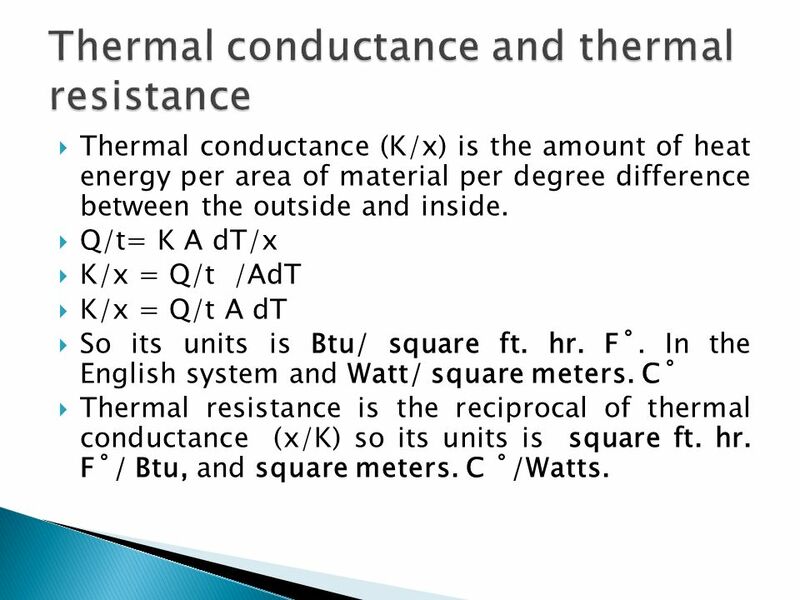 C˚ Thermal resistance is the reciprocal of thermal conductance (x/K) so its units is square ft. hr. F˚/ Btu, and square meters. C ˚/Watts. 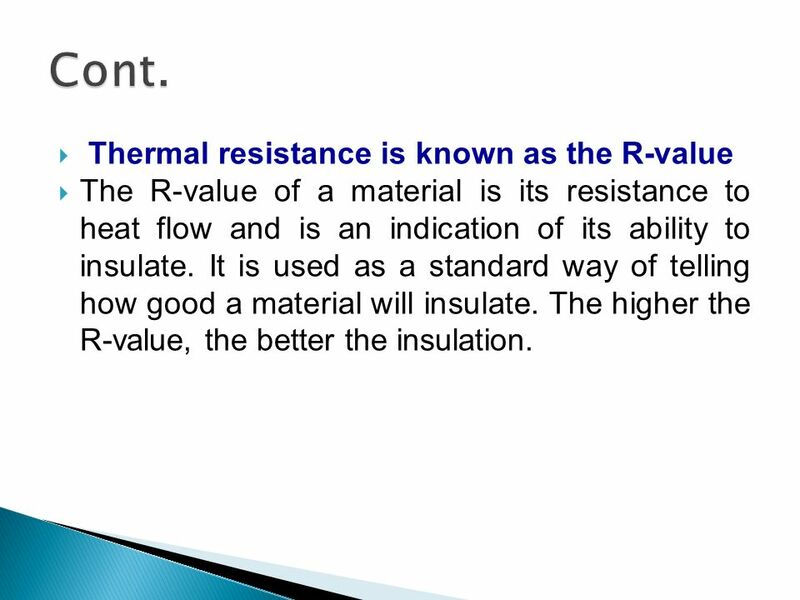 The R-value of a material is its resistance to heat flow and is an indication of its ability to insulate. It is used as a standard way of telling how good a material will insulate. The higher the R-value, the better the insulation. 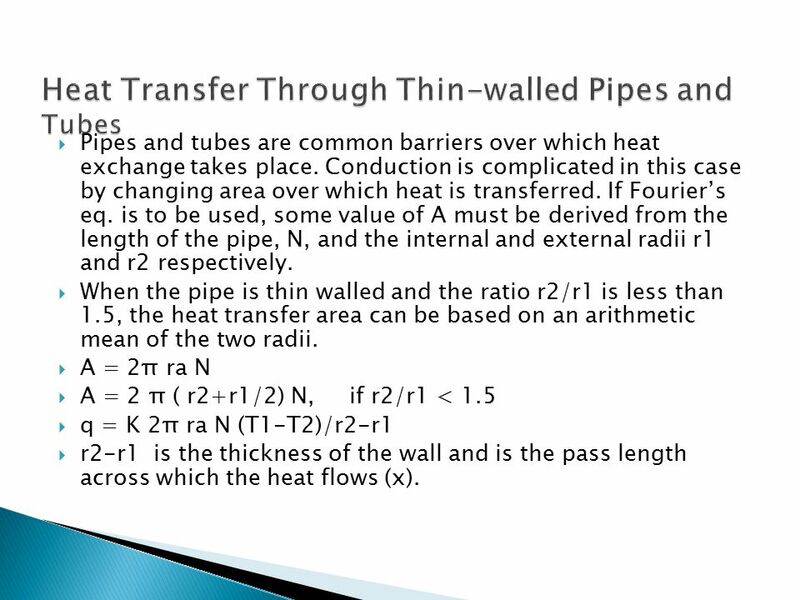 Pipes and tubes are common barriers over which heat exchange takes place. Conduction is complicated in this case by changing area over which heat is transferred. If Fourier’s eq. is to be used, some value of A must be derived from the length of the pipe, N, and the internal and external radii r1 and r2 respectively. When the pipe is thin walled and the ratio r2/r1 is less than 1.5, the heat transfer area can be based on an arithmetic mean of the two radii. A = 2π ra N A = 2 π ( r2+r1/2) N, if r2/r1 < 1.5 q = K 2π ra N (T1-T2)/r2-r1 r2-r1 is the thickness of the wall and is the pass length across which the heat flows (x). 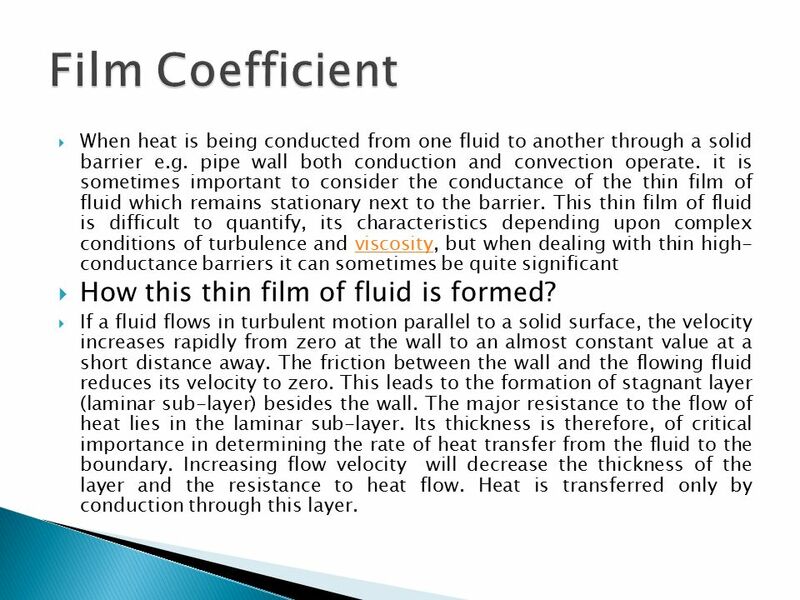 23 Film Coefficient How this thin film of fluid is formed? When heat is being conducted from one fluid to another through a solid barrier e.g. pipe wall both conduction and convection operate. it is sometimes important to consider the conductance of the thin film of fluid which remains stationary next to the barrier. This thin film of fluid is difficult to quantify, its characteristics depending upon complex conditions of turbulence and viscosity, but when dealing with thin high- conductance barriers it can sometimes be quite significant How this thin film of fluid is formed? If a fluid flows in turbulent motion parallel to a solid surface, the velocity increases rapidly from zero at the wall to an almost constant value at a short distance away. The friction between the wall and the flowing fluid reduces its velocity to zero. This leads to the formation of stagnant layer (laminar sub-layer) besides the wall. The major resistance to the flow of heat lies in the laminar sub-layer. 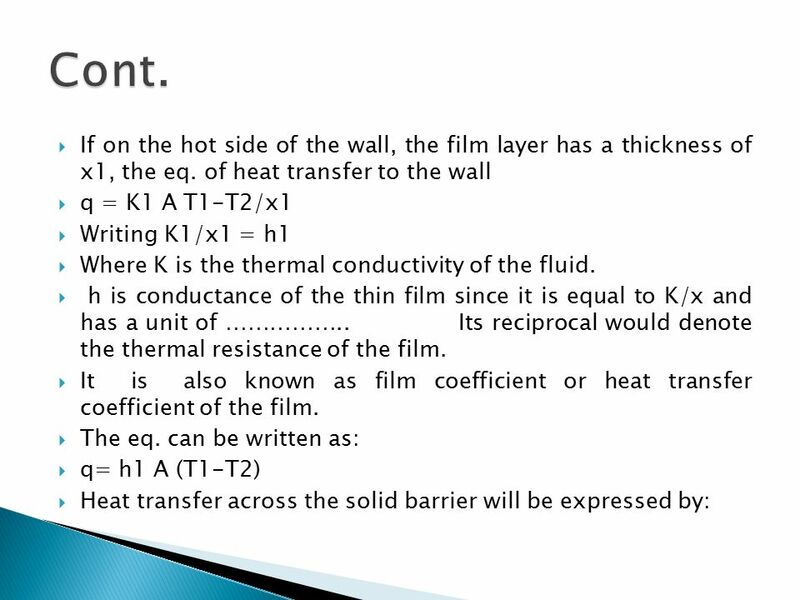 Its thickness is therefore, of critical importance in determining the rate of heat transfer from the fluid to the boundary. 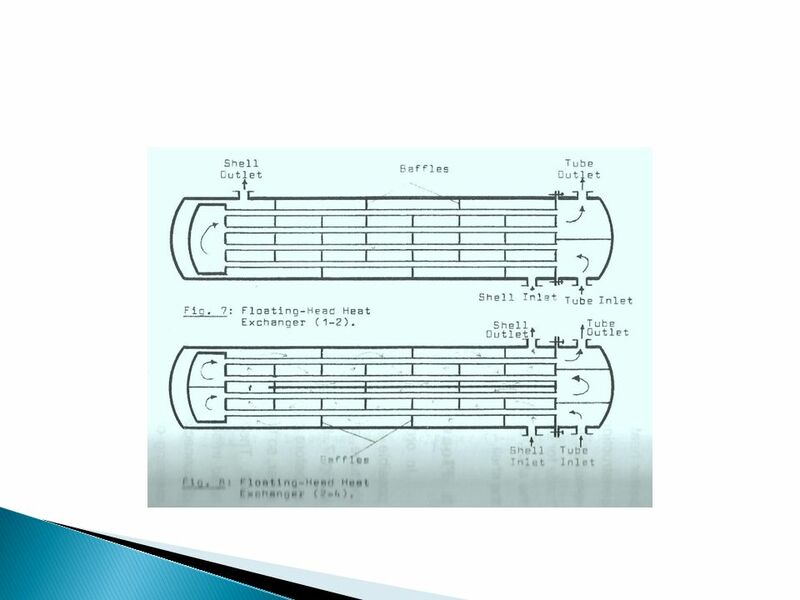 Increasing flow velocity will decrease the thickness of the layer and the resistance to heat flow. Heat is transferred only by conduction through this layer. 27 Cont. 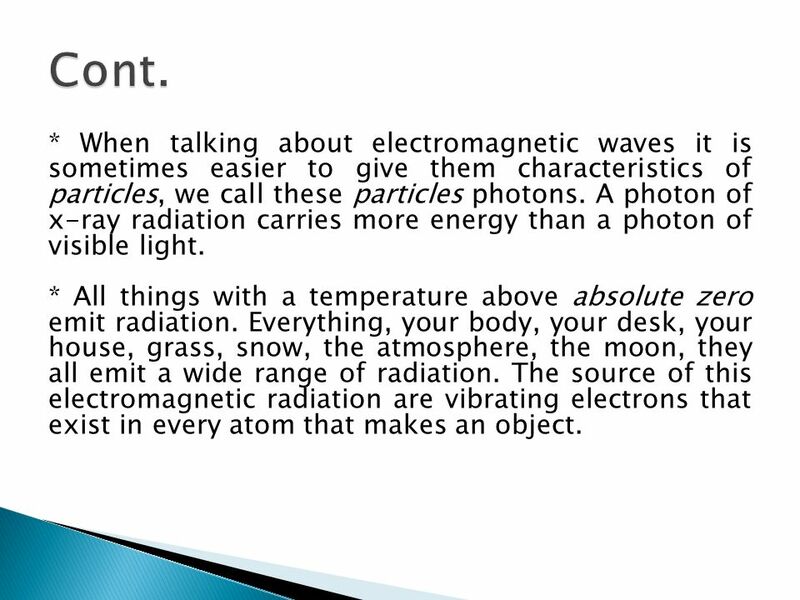 * When talking about electromagnetic waves it is sometimes easier to give them characteristics of particles, we call these particles photons. A photon of x-ray radiation carries more energy than a photon of visible light. * All things with a temperature above absolute zero emit radiation. Everything, your body, your desk, your house, grass, snow, the atmosphere, the moon, they all emit a wide range of radiation. The source of this electromagnetic radiation are vibrating electrons that exist in every atom that makes an object. Absorbed Increasing the internal energy of the gas molecules. This fraction is called absorptivity (a). Reflected Radiation is not absorbed or emitted from an object but it reaches the object and is sent backward. This fraction is called reflectivity (r) Scattered Scattered light is deflected in all directions, forward, backward, sideways. It is also called diffused light. 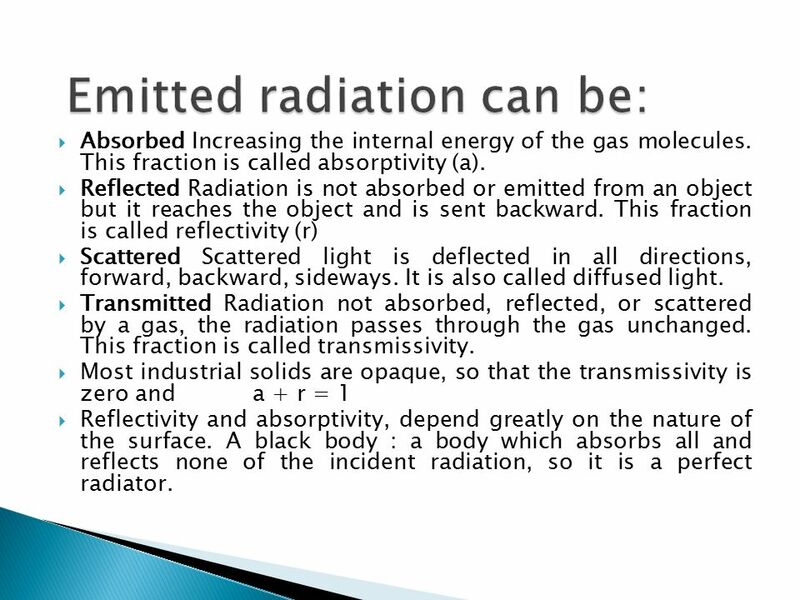 Transmitted Radiation not absorbed, reflected, or scattered by a gas, the radiation passes through the gas unchanged. This fraction is called transmissivity. Most industrial solids are opaque, so that the transmissivity is zero and a + r = 1 Reflectivity and absorptivity, depend greatly on the nature of the surface. A black body : a body which absorbs all and reflects none of the incident radiation, so it is a perfect radiator. 29 Cont. 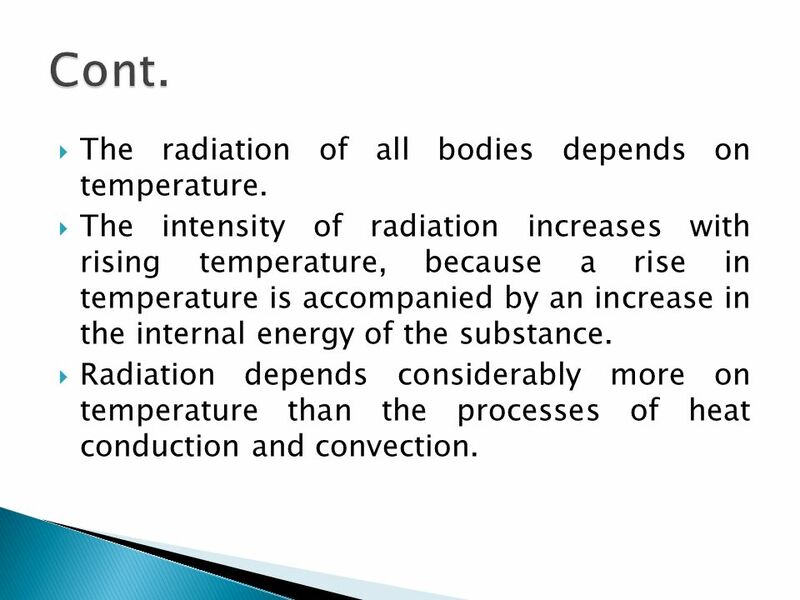 The radiation of all bodies depends on temperature. The intensity of radiation increases with rising temperature, because a rise in temperature is accompanied by an increase in the internal energy of the substance. 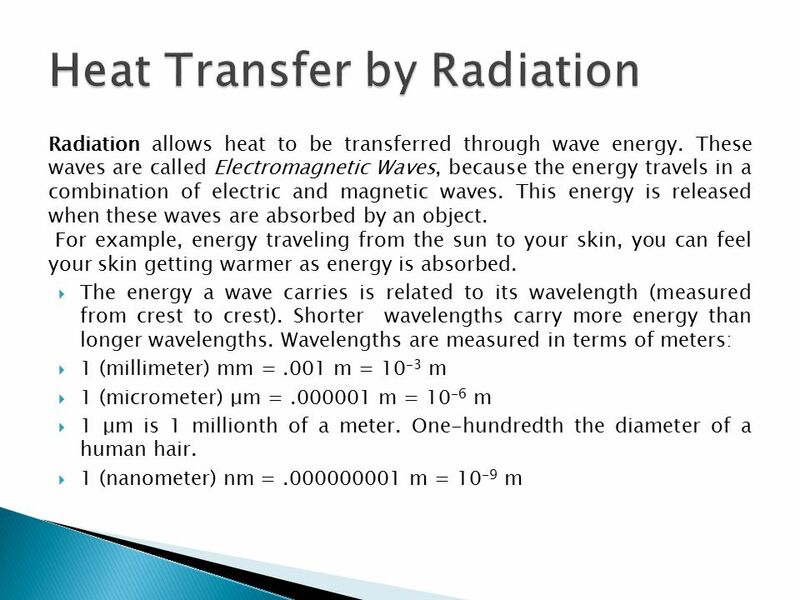 Radiation depends considerably more on temperature than the processes of heat conduction and convection. 30 Cont. 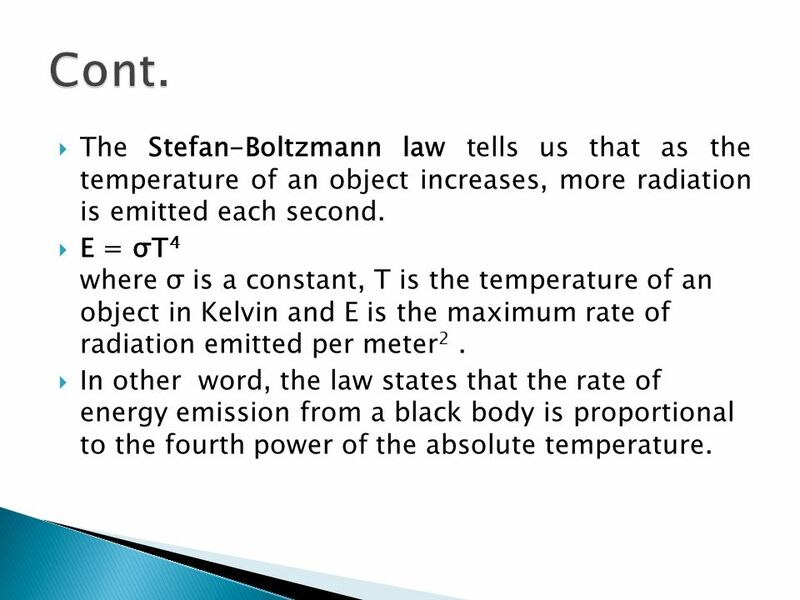 The Stefan-Boltzmann law tells us that as the temperature of an object increases, more radiation is emitted each second. E = σT4 where σ is a constant, T is the temperature of an object in Kelvin and E is the maximum rate of radiation emitted per meter2 . In other word, the law states that the rate of energy emission from a black body is proportional to the fourth power of the absolute temperature. 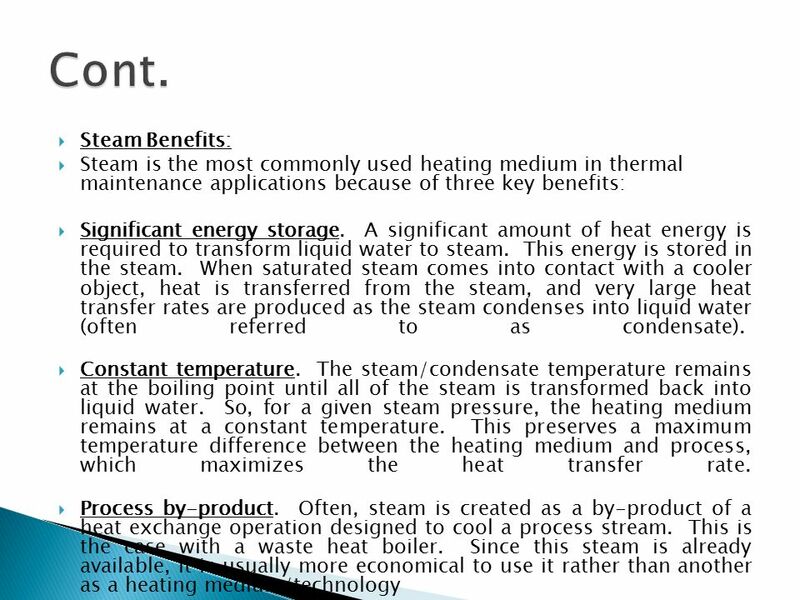 34 How Does Steam Provide Stable, Even Heating? 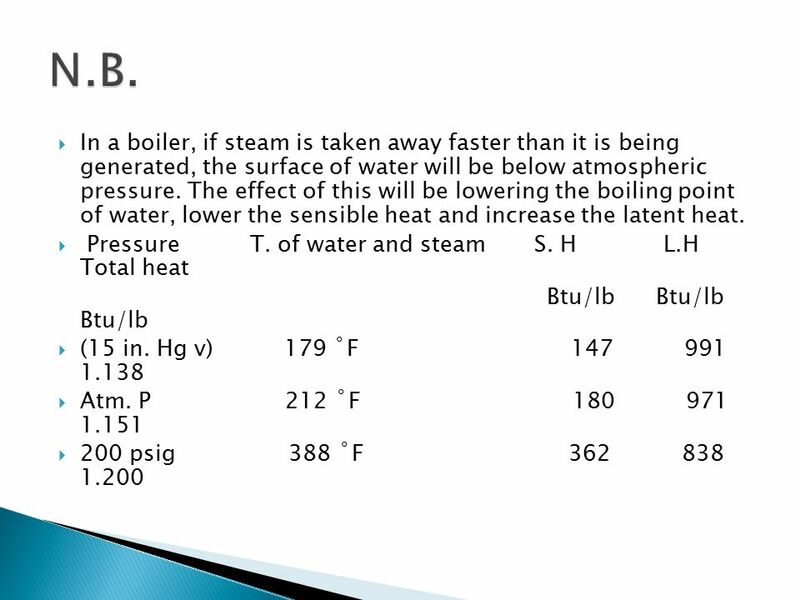 In the case of saturated steam, if the steam pressure is known then the steam temperature may be determined. Pressure changes instantaneously within a space. 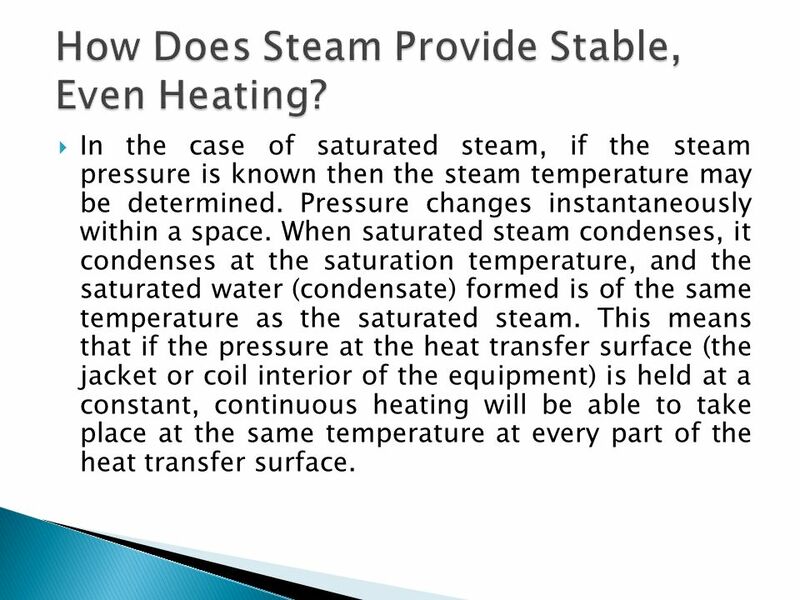 When saturated steam condenses, it condenses at the saturation temperature, and the saturated water (condensate) formed is of the same temperature as the saturated steam. 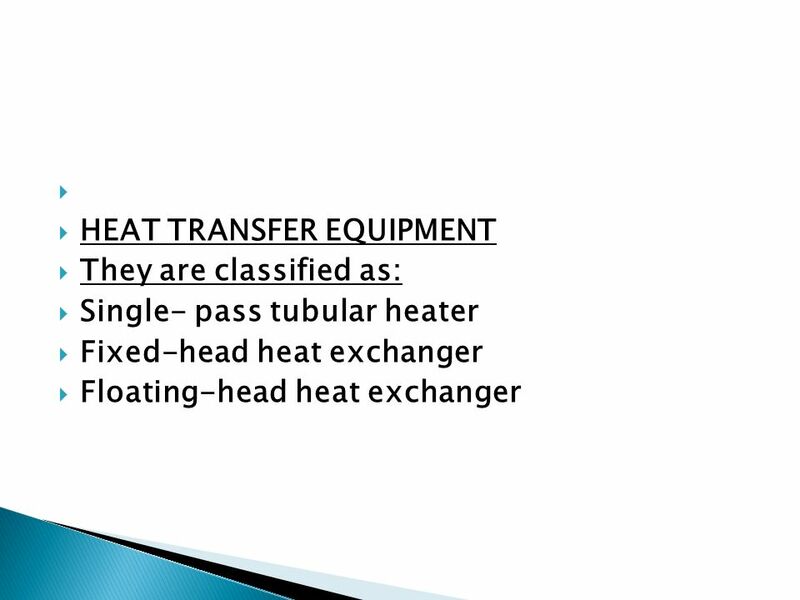 This means that if the pressure at the heat transfer surface (the jacket or coil interior of the equipment) is held at a constant, continuous heating will be able to take place at the same temperature at every part of the heat transfer surface. 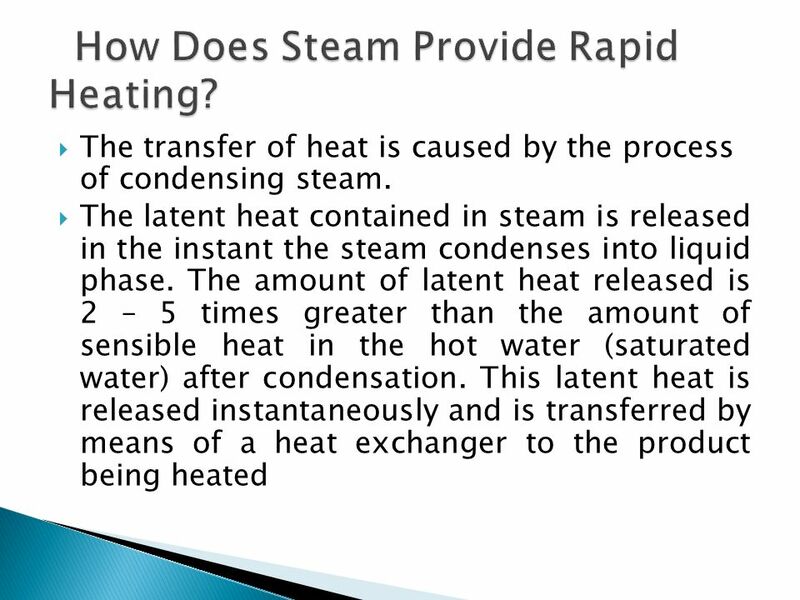 35 How Does Steam Provide Rapid Heating? 1- Saturated steam (wet): Steam directly arising from boiling water, whether under atmospheric or higher pressures, is said to be saturated. 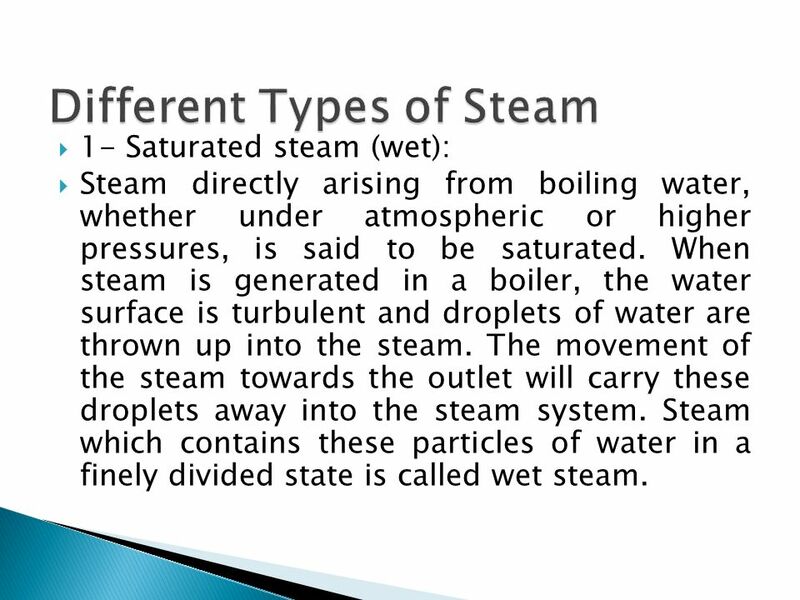 When steam is generated in a boiler, the water surface is turbulent and droplets of water are thrown up into the steam. The movement of the steam towards the outlet will carry these droplets away into the steam system. 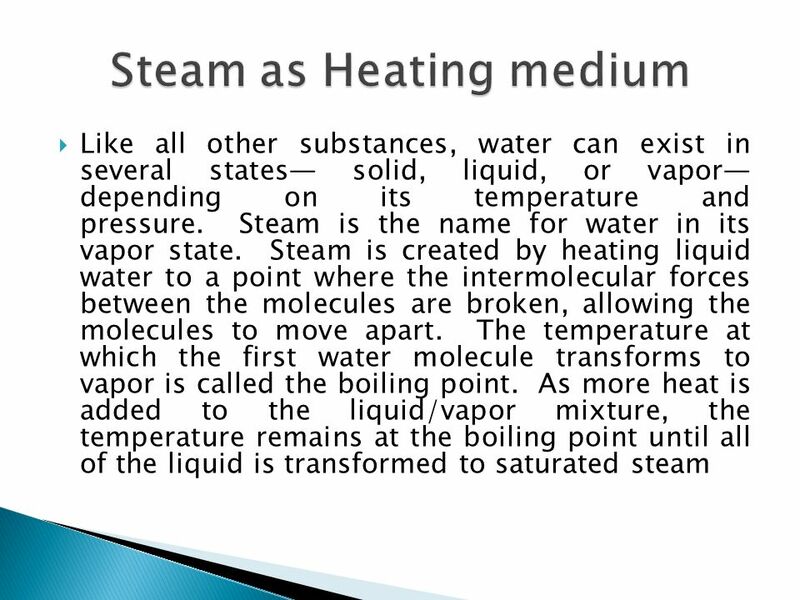 Steam which contains these particles of water in a finely divided state is called wet steam. 40 Cont. In other words, the better the quality of steam, the less water it contains, the higher will be the possible rate of production. The simplest method of obtaining dry steam is by the use of steam dryers or steam separators. 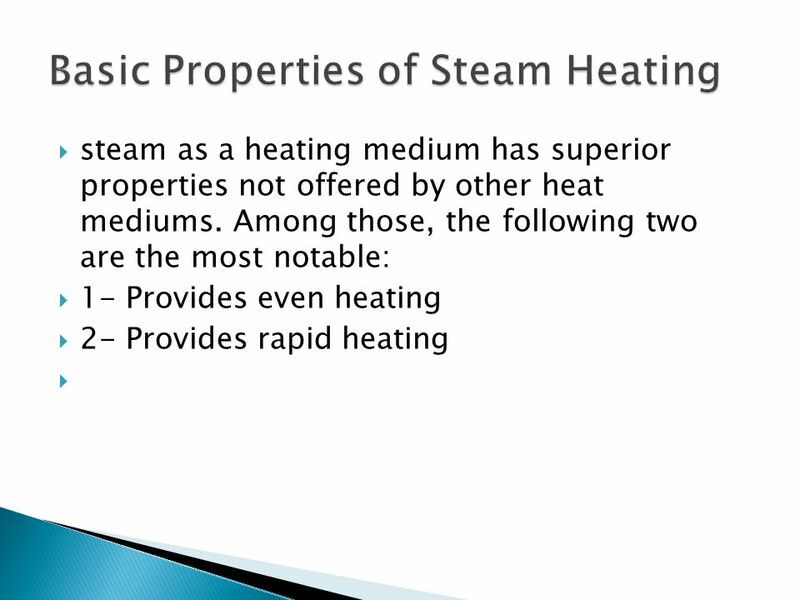 Steam Dryer: The presence of water in steam pipes should never be permitted. Water being a better conductor of heat than dry steam, will act as a conductor between the steam and the metallic pipe, setting up active condensation and preventing economical working of boiler. The steam dryers separate water particles from flowing steam by two distinct methods, both of which operate by the difference in density of steam and water. The water separator is always fitted near the boiler to separate water carried forward mechanically from the boiler. Insulation is a barrier that minimizes the transfer of heat energy from one material to another by reducing the conduction, convection and/or radiation effects. 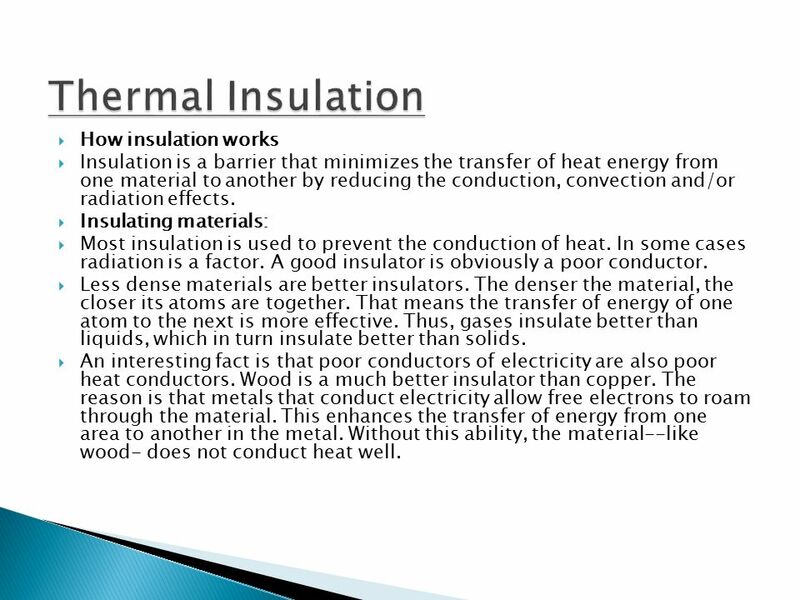 Insulating materials: Most insulation is used to prevent the conduction of heat. In some cases radiation is a factor. A good insulator is obviously a poor conductor. Less dense materials are better insulators. The denser the material, the closer its atoms are together. That means the transfer of energy of one atom to the next is more effective. Thus, gases insulate better than liquids, which in turn insulate better than solids. 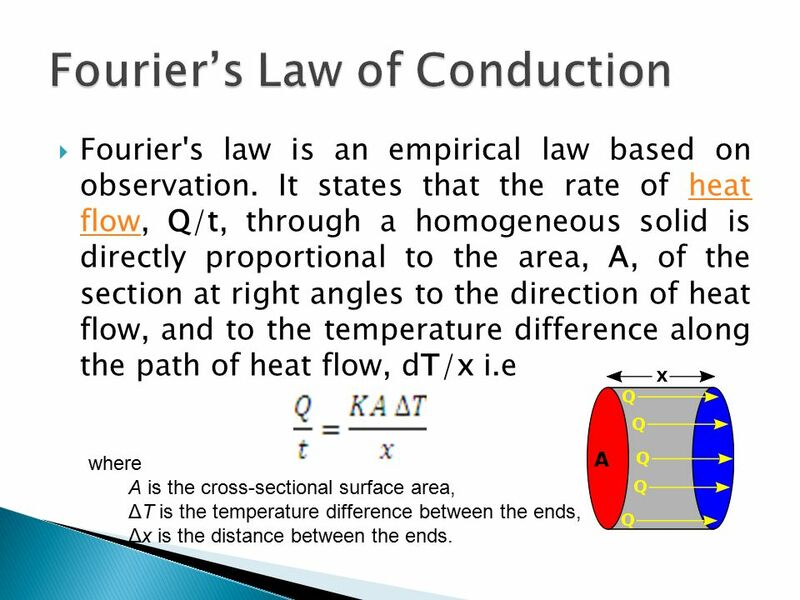 An interesting fact is that poor conductors of electricity are also poor heat conductors. Wood is a much better insulator than copper. The reason is that metals that conduct electricity allow free electrons to roam through the material. This enhances the transfer of energy from one area to another in the metal. Without this ability, the material--like wood- does not conduct heat well. Conduction occurs when materials— especially solids—are in direct contact with each other. High kinetic energy atoms and molecules bump into their neighbors, increasing the neighbor's energy. This increase in energy can flow through materials and from one material to another. 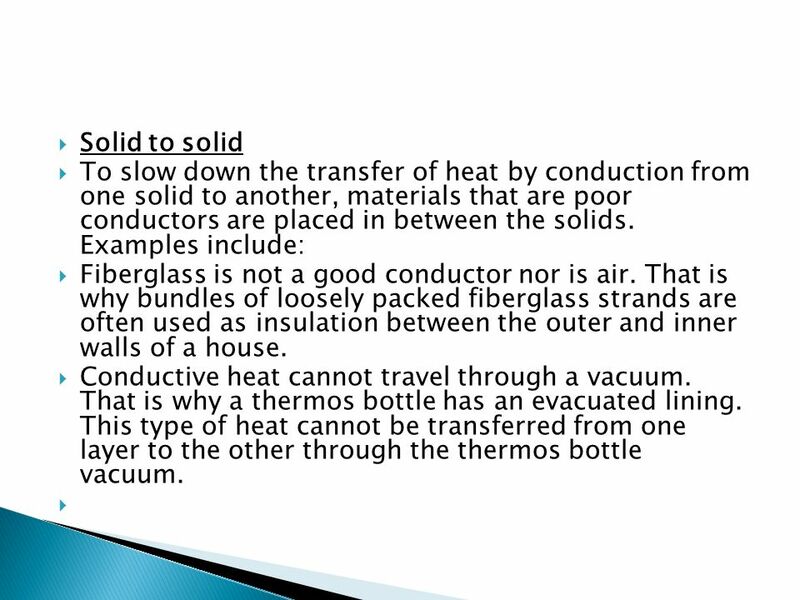 43 Solid to solid To slow down the transfer of heat by conduction from one solid to another, materials that are poor conductors are placed in between the solids. Examples include: Fiberglass is not a good conductor nor is air. That is why bundles of loosely packed fiberglass strands are often used as insulation between the outer and inner walls of a house. Conductive heat cannot travel through a vacuum. That is why a thermos bottle has an evacuated lining. This type of heat cannot be transferred from one layer to the other through the thermos bottle vacuum. 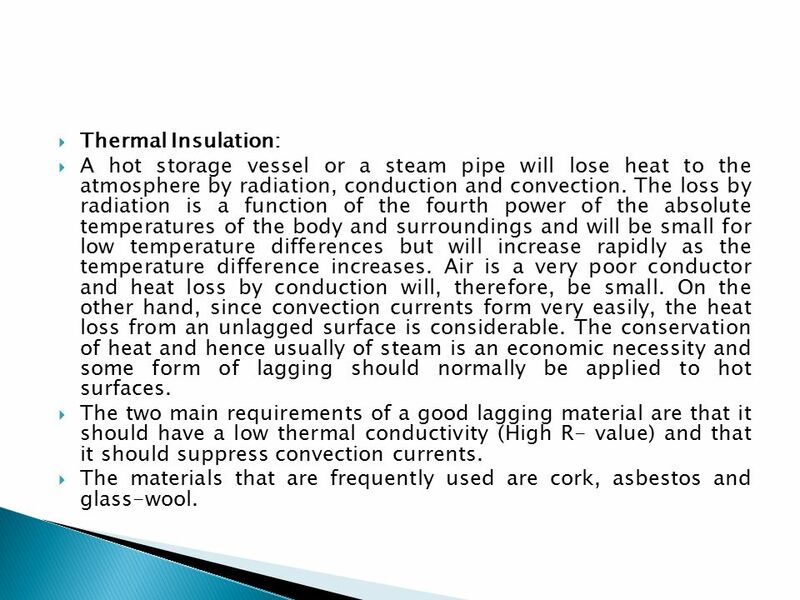 44 Thermal Insulation: A hot storage vessel or a steam pipe will lose heat to the atmosphere by radiation, conduction and convection. The loss by radiation is a function of the fourth power of the absolute temperatures of the body and surroundings and will be small for low temperature differences but will increase rapidly as the temperature difference increases. Air is a very poor conductor and heat loss by conduction will, therefore, be small. On the other hand, since convection currents form very easily, the heat loss from an unlagged surface is considerable. The conservation of heat and hence usually of steam is an economic necessity and some form of lagging should normally be applied to hot surfaces. The two main requirements of a good lagging material are that it should have a low thermal conductivity (High R- value) and that it should suppress convection currents. The materials that are frequently used are cork, asbestos and glass-wool. For a circular pipe with length very large compared to outer diameter, it may be assumed that the heat flows only in radial directions. If a layer of insulation installed around the circular pipe to reduce the amount of heat transfer, then it is assumed that the heat transfer will be decreased by adding more insulation. By adding the insulation around the pipe the outside surface area is increased, which will increase the heat transfer. 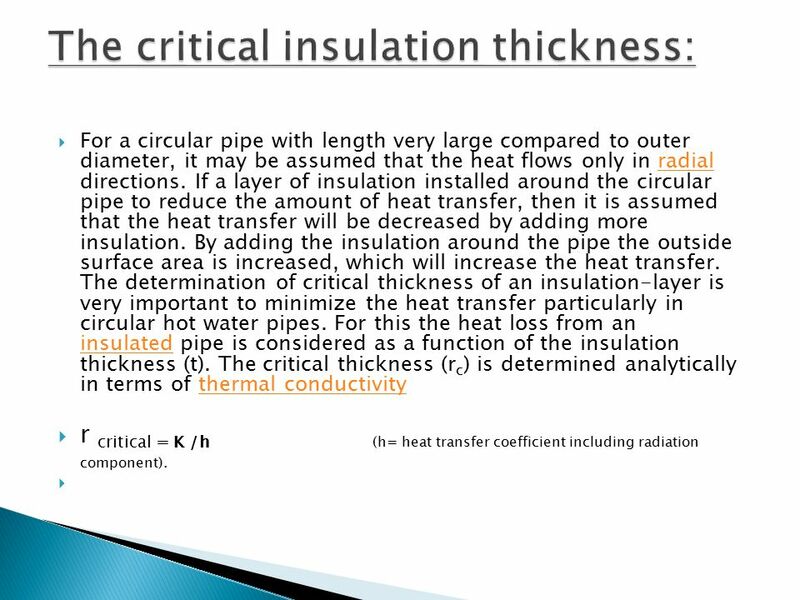 The determination of critical thickness of an insulation-layer is very important to minimize the heat transfer particularly in circular hot water pipes. For this the heat loss from an insulated pipe is considered as a function of the insulation thickness (t). 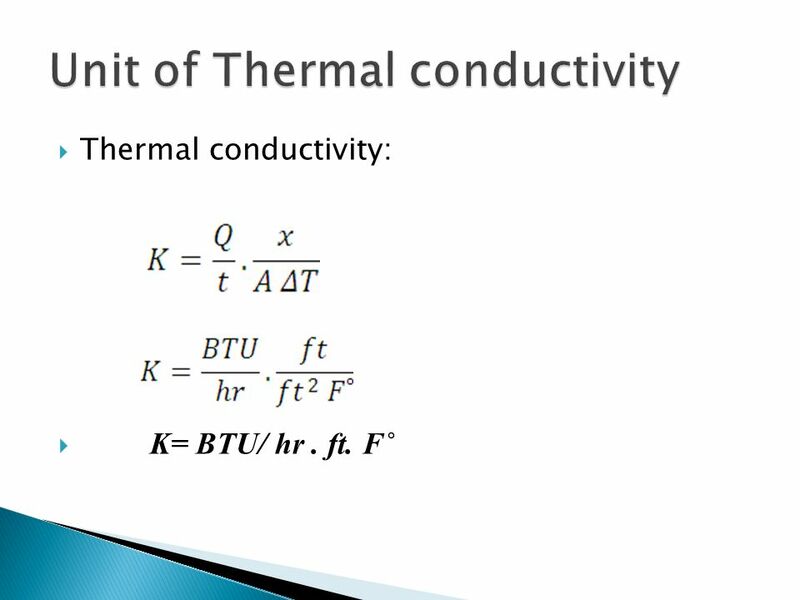 The critical thickness (rc) is determined analytically in terms of thermal conductivity r critical = K /h (h= heat transfer coefficient including radiation component). Increasing the thickness of the lagging will reduce the loss of heat and thus give a saving in the operating costs. 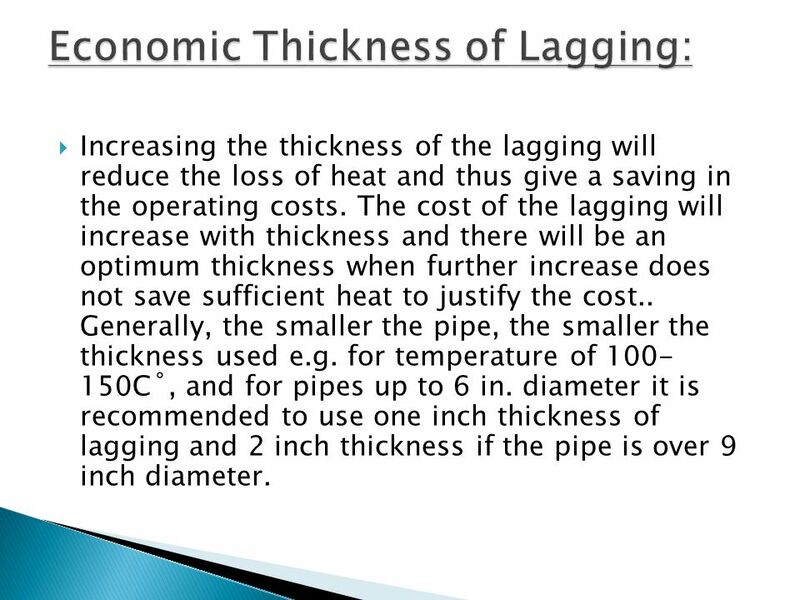 The cost of the lagging will increase with thickness and there will be an optimum thickness when further increase does not save sufficient heat to justify the cost.. Generally, the smaller the pipe, the smaller the thickness used e.g. for temperature of C˚, and for pipes up to 6 in. diameter it is recommended to use one inch thickness of lagging and 2 inch thickness if the pipe is over 9 inch diameter. R= ΔT/(q/A) The units of R-value are m2˚C /W. Note: “R-value” differs from the resistance. 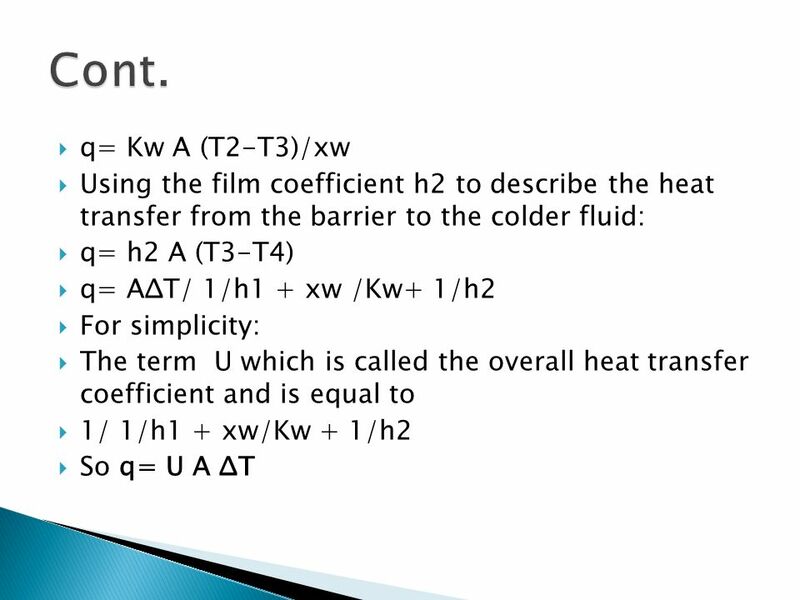 In R- value we use heat flow per unit area. 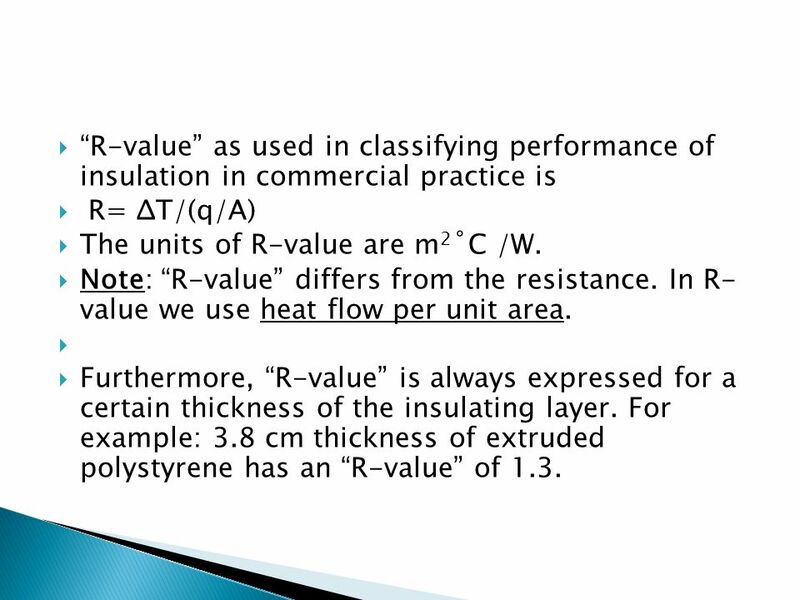 Furthermore, “R-value” is always expressed for a certain thickness of the insulating layer. For example: 3.8 cm thickness of extruded polystyrene has an “R-value” of 1.3. 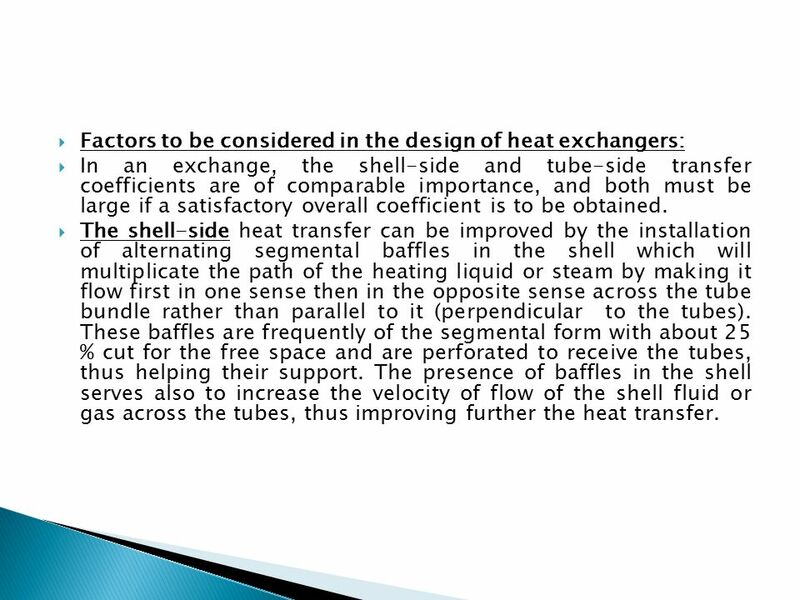 In an exchange, the shell-side and tube-side transfer coefficients are of comparable importance, and both must be large if a satisfactory overall coefficient is to be obtained. 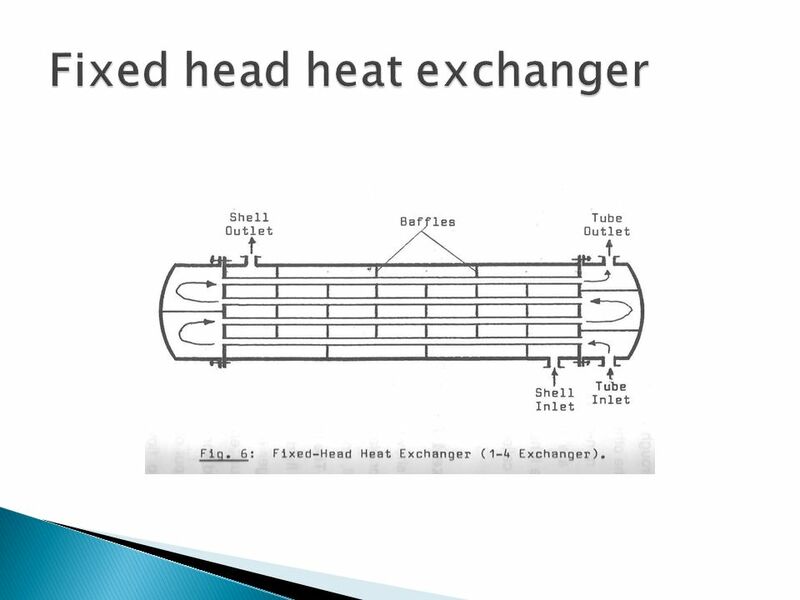 The shell-side heat transfer can be improved by the installation of alternating segmental baffles in the shell which will multiplicate the path of the heating liquid or steam by making it flow first in one sense then in the opposite sense across the tube bundle rather than parallel to it (perpendicular to the tubes). These baffles are frequently of the segmental form with about 25 % cut for the free space and are perforated to receive the tubes, thus helping their support. 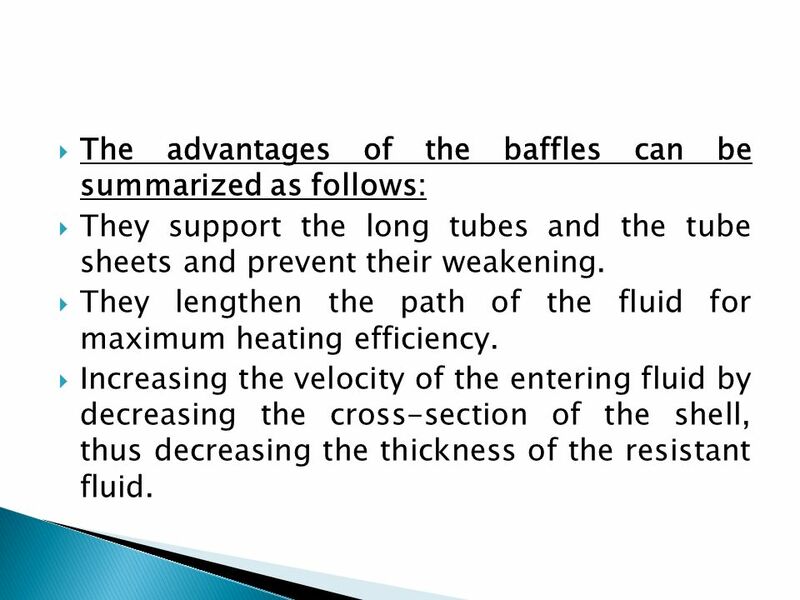 The presence of baffles in the shell serves also to increase the velocity of flow of the shell fluid or gas across the tubes, thus improving further the heat transfer. They support the long tubes and the tube sheets and prevent their weakening. They lengthen the path of the fluid for maximum heating efficiency. Increasing the velocity of the entering fluid by decreasing the cross-section of the shell, thus decreasing the thickness of the resistant fluid. 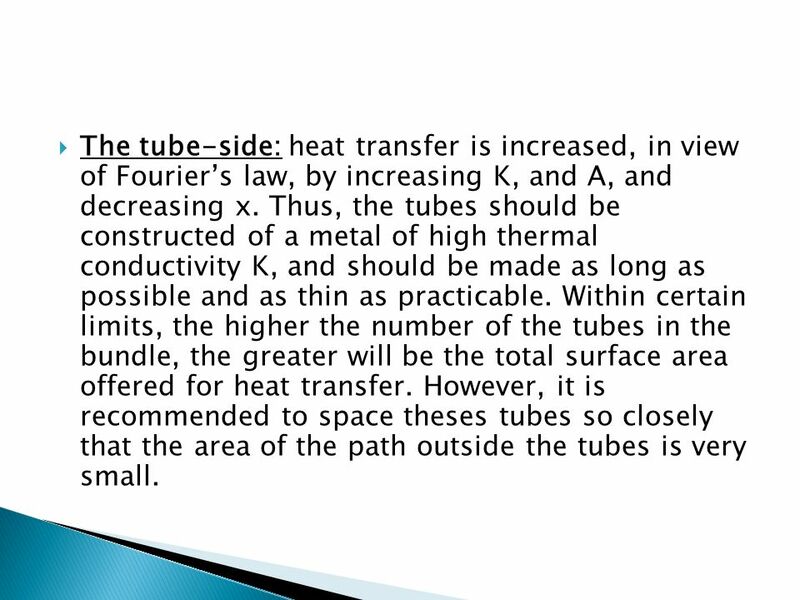 55 The tube-side: heat transfer is increased, in view of Fourier’s law, by increasing K, and A, and decreasing x. Thus, the tubes should be constructed of a metal of high thermal conductivity K, and should be made as long as possible and as thin as practicable. 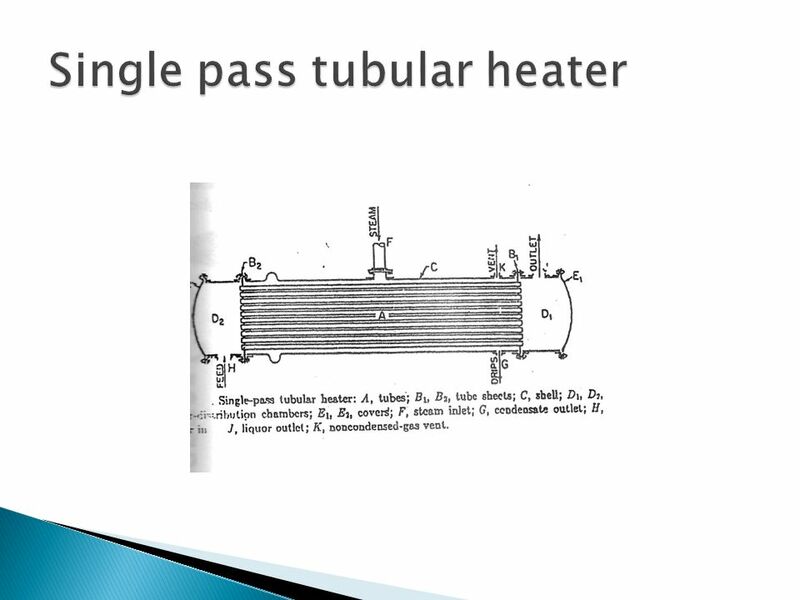 Within certain limits, the higher the number of the tubes in the bundle, the greater will be the total surface area offered for heat transfer. However, it is recommended to space theses tubes so closely that the area of the path outside the tubes is very small. If the hot and cold fluid flow in one direction parallel to each other, it is referred to as a parallel-flow apparatus as in the following figure (a). 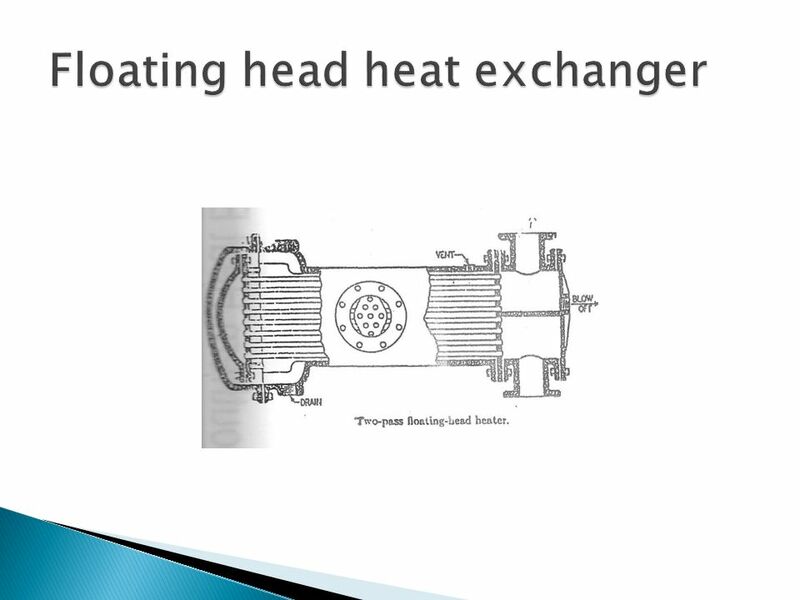 If the two fluids flow parallel to one another but in opposite directions, the heat exchanger is known as a counterflow device (b). If the fluids cross each other, the pattern is referred to as cross –flow (c). In addition to these simple flow arrangements, more complex ones are encountered in practice: simultaneous parallel and cross-flow (d), and multiple cross-flow (e). 1.1 INFRARED RADIATION 1.2 SURFACES AND RADIATION 1.3 STATES OF MATTER 1.4 CONDUCTION 1.5 CONVECTION 1.6 EVAPORATION AND CONDENSATION 1.7 ENERGY TRANSFER. The Nature of Heat 6.2 Heat Heat is thermal energy that flows from something at a higher temperature to something at a lower temperature. Heat is a form. 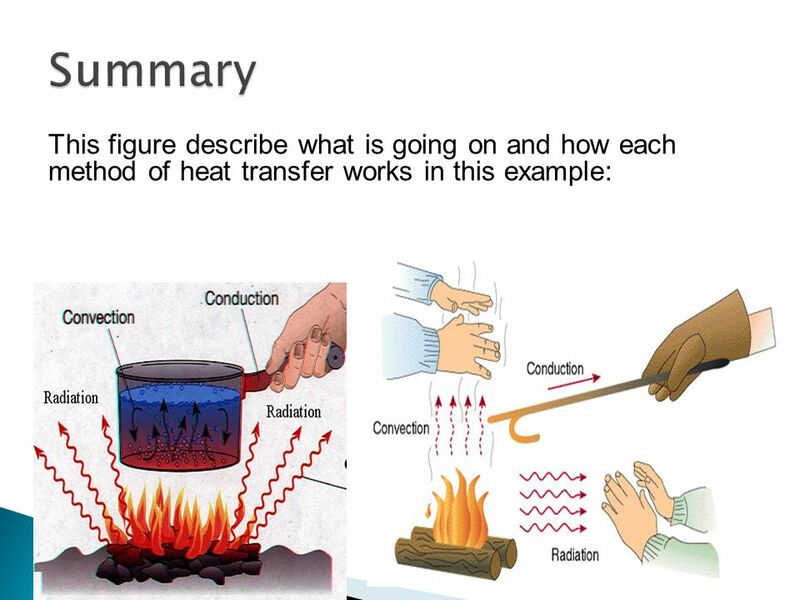 Conduction Conduction is the transfer of thermal energy by collisions between particles in matter. 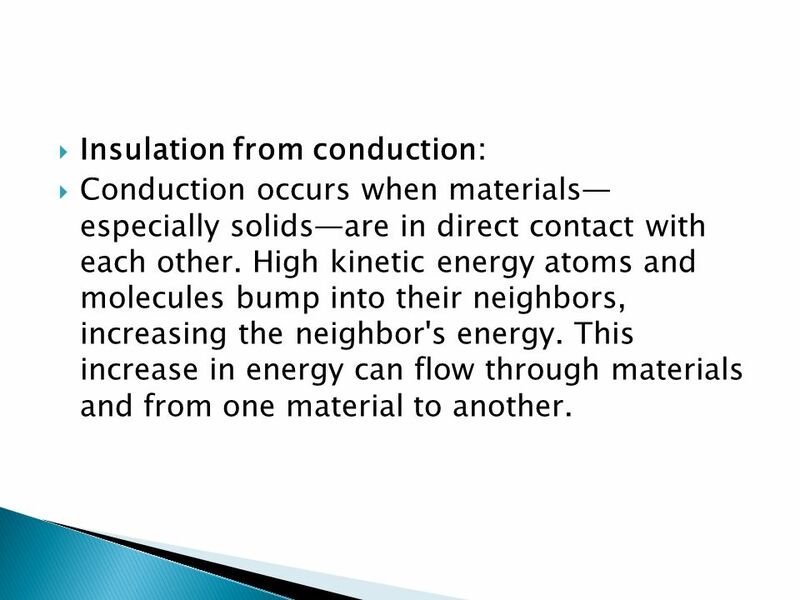 Conduction occurs because particles in matter are in. 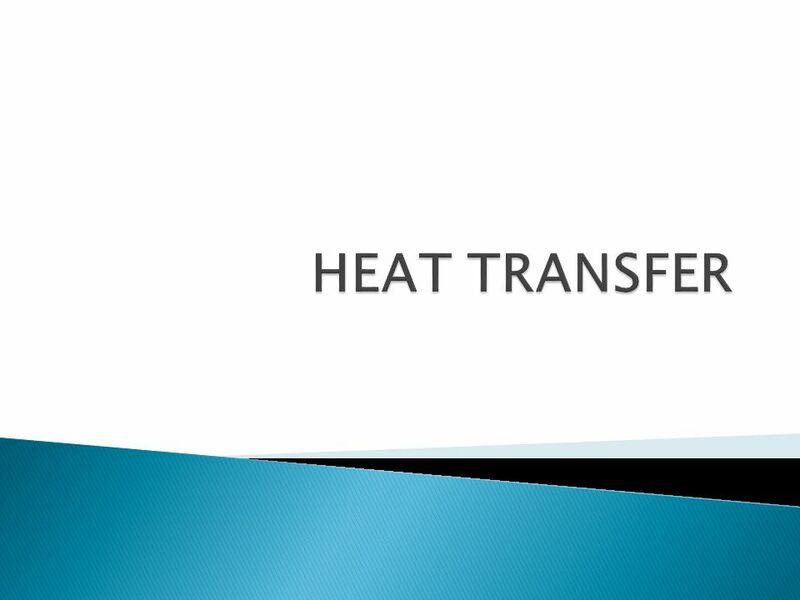 Heat Transfer  How is heat transferred from one place to another?  What is moving? 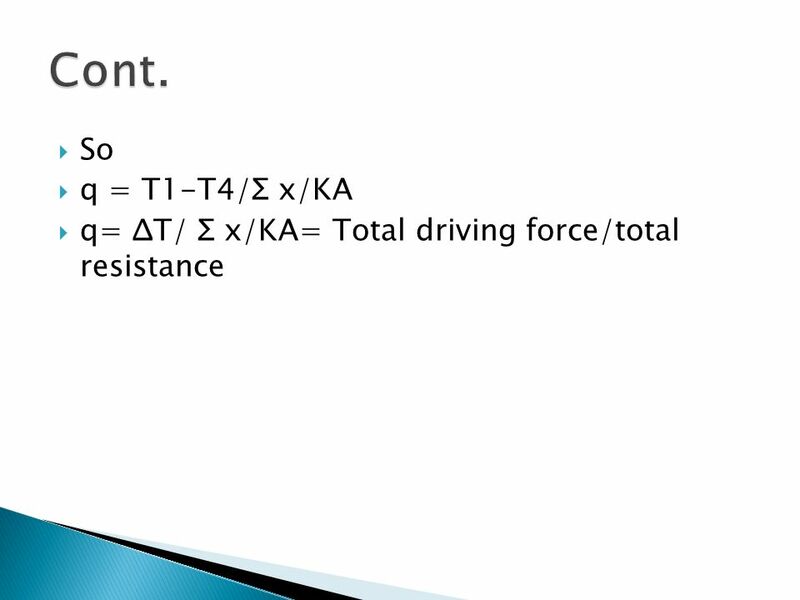  In mechanics energy can be transferred through a particle (e.g.